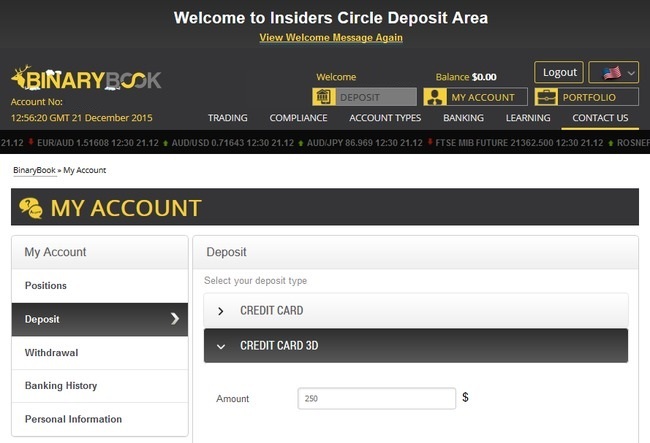 Insiders Circle Scam Review - Don't Get Cheated! 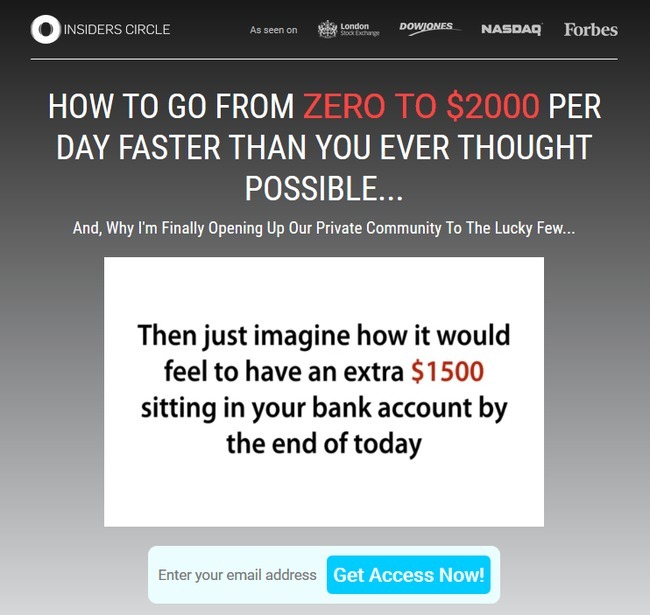 Matt Warren, the alleged owner of Insiders Circle scam promises you a free system that brings you $2,000 profit every single day. Sounds too good to be true? Let’s find out the ugly truth behind the system in our Insiders Circle review. Insiders Circle scam found at insiderscircle.co has a simple homepage. Apart from the false claim at the top of the page, there is only an auto-play sales video that tries to lure you into the trap. In the sales video, the alleged owner of Insiders Circle scam, Matt Warren spent a good 5 minutes trying to feed your imaginations. He keeps asking you to imagine scenarios where you don’t have any money problems, being able to afford anything your family wants, and the day where you finally kiss goodbye to your boss. Matt Warren then proceeds to tell you that you can achieve all these without much work at all, because his binary trading system will help you make $2,000 per day guaranteed. And he’ll give away his system for free! Are these are big red flags of a typical online scam. Someone is giving you an automated system for free, and you can make $2,000 per day without much work and any trading experience? If it sounds too good to be true, it probably is. There are a lot of money to be made online, but not through shady systems like Insiders Circle scam. Read on to find out what Insiders Circle scam is trying to hide from you. If you don’t have any experience with binary trading, allow me a moment to explain how it works. If you have been trading binary options, you may skip this segment. Binary trading is basically a much simpler form of trading. Instead of analyzing financial news and charts, you only need to guess if the price of an asset will rise or fall after a short period of time, usually between 30 seconds to minutes. This is how it works – let’s say I feel that the price of gold market will rise 4 minutes from now, and I bet $50 on a 4-minutes contract. When the contract expires, and the price is indeed higher, I win a certain percentage of what I bet, usually between 60% to 80% ($30 to $40). But if I’m wrong, I lose the entire $50 that I bet. Does it sound a lot like gambling? Much like guessing the outcome of a coin toss, there’s no way to predict the market’s movements in such a short period of time. You are pretty much doing it blindly, depending on pure luck and gut feelings. Even if you manage a decent 50% win rate, you will still lose money due to the uneven winning vs losing payout in binary options. The difference in payouts is how the brokers make big money off the traders. How Does Insiders Circle Work? Insiders Circle claims that you’ll be assigned a personal coach. Back to Insiders Circle scam. Matt Warren claims that you’ll be assigned a personal “insider” coach when you sign up for his free Insiders Circle membership. You will receive trading signals from the coach and he will guide you to $2,000 profits per day. But is there really a private coach? Let’s see what the victims of Insiders Circle scam have to say about the system. Instead of a private coach, Insiders Circle scam connects you to a trading bot. There are plenty of similar complaints out there, so don’t keep your hopes high with Insiders Circle system. Don’t be fooled by the trade results and their sales presentation, because nothing is real when it comes to Insiders Circle scam. You may read some positive reviews on websites encouraging you to join Insiders Circle, but it is simply because there is a $250 commission to be made every time the affiliate successfully refer a new victim to the scam. Disclaimer of Insiders Circle is purposely made difficult to read. If you take some time to read the disclaimer of Insiders Circle (which no one does), you’ll realize that Matt Warren has some dirty secrets to hide about Insiders Circle scam. Do not invest money you cannot afford to lose. You can lose more than your initial deposit and stake. Insiders Circle and everyone related to it are not responsible for any losses related to use of its services or software. Simulated results do not represent actual trading. No trades have been executed. Insiders Circle is only sharing information in good faith and is not making any recommendations to invest. Even though they did not mention a single word about the risks in their sales materials, Insiders Circle scam admits that trading binary options is very risky. You can lose more than what you deposit due to leveraging. Despite promising you $2,000 profits a day, Insiders Circle and everyone related to it are not responsible for your losses. NO TRADES have been executed using Insiders Circle signals. All results shown are hypothetical. Despite coercing you to use their signals, Insiders Circle claims that they are only sharing information, and they are not making any recommendations to invest. Fact #3 alone should be enough to alert you to steer clear of the scam. Can you really trust a system that base their entire sales claims on speculations? Unfortunately, almost no one reads the disclaimer. Why does Insiders Circle include such terms in their disclaimer? If you think they want to give you a fair warning, you are wrong. It’s simply to protect themselves from legal actions when you lose all your money using Matt Warren’s Insiders Circle signals. 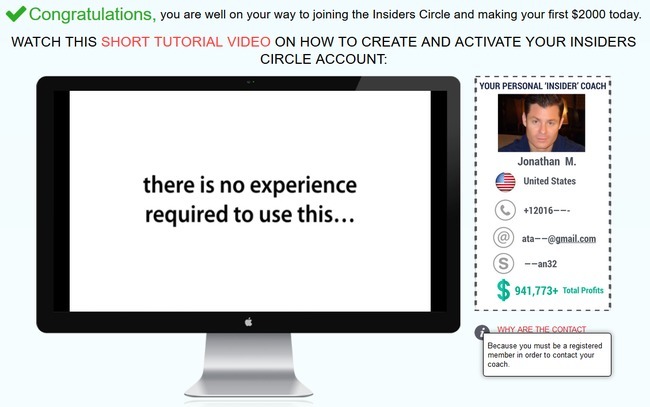 How Does Insiders Circle Make Money Off You? I was assigned to BinaryBook, one of Insiders Circle’s affiliated brokers. You may wonder why Matt Warren makes so much effort to promote Insiders Circle just to give it away for free. Firstly, if you decide to use his software and sign up for a broker account through their sales page, the scammers behind Insiders Circle will earn a sum of referral fees as soon as you bank in your first deposit. The minimum deposit for BinaryBook is $250, and you need to fund your account before you can activate Insiders Circle auto-trading software. Keep in mind that you cannot use the software on any other brokers, or even on your existing account with their affiliated broker (such as BinaryBook). You need to sign up for a brand new account, because the scammers cannot get their referral fees if you don’t sign up through their affiliate link. Not only that, Insiders Circle will continue to make money off you over the long term. The team behind the scam will earn a commission for every trade that the software makes for you. To put it simply, the scammers will earn a profit regardless of whether you make or lose money, as long as you still have balance in your account. Is Insiders Circle a Scam? YES, INSIDERS CIRCLE IS A SCAM. As we’ve said in the review earlier, we don’t recommend binary options trading as a way to make money online, at all. It’s not that different from gambling, and using an automated trading software is no different. You are essentially putting your hopes and entire investment in a piece of software that gambles on your behalf.